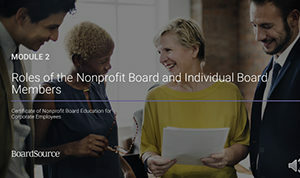 BoardSource’s governance education program, the Certificate of Nonprofit Board Education for Corporate Employees, is designed for those who want to learn how to leverage their unique skills to make a difference and be an effective and engaged nonprofit board member. The three-module, on-demand or live webinar program, covers the benefits of serving on a nonprofit board and the questions to ask when searching for a board to join, the differences between the for-profit, government and nonprofit sectors, the fundamental nonprofit governance concepts every nonprofit leader should understand, as well as how you can have a positive and lasting impact on the nonprofit you serve. During the course of this certificate program, you will also learn about the legal responsibilities of board members, how to manage conflicts of interest, fulfilling your board roles and responsibilities, building a diverse board; the board-staff partnership; board meetings and the use of committees; the board’s fundraising role; board member motivation, responsibilities, and accountability; and how to be an advocate for your nonprofit. 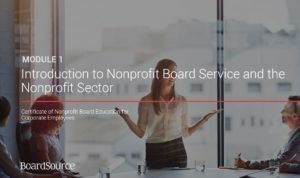 Gain insights and receive resources, including The Governance Series, that further your understanding of the fundamentals of nonprofit board service. 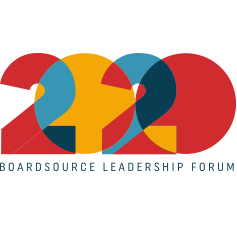 Develop a network of peers who are other BoardSource members to gain mutual support, and to share information through our community on the BoardSource Exchange. Examine approaches, assumptions, and practices about nonprofit board service; you’ll be prepared to put the learning to work with access to a “course portal” that includes tools, templates, and other materials. Explore the benefits of joining a nonprofit board and how to prepare for board service. 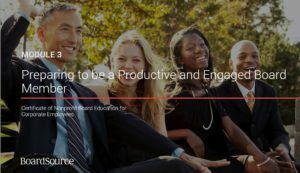 Learn how to leverage your unique skills in service to a nonprofit board. 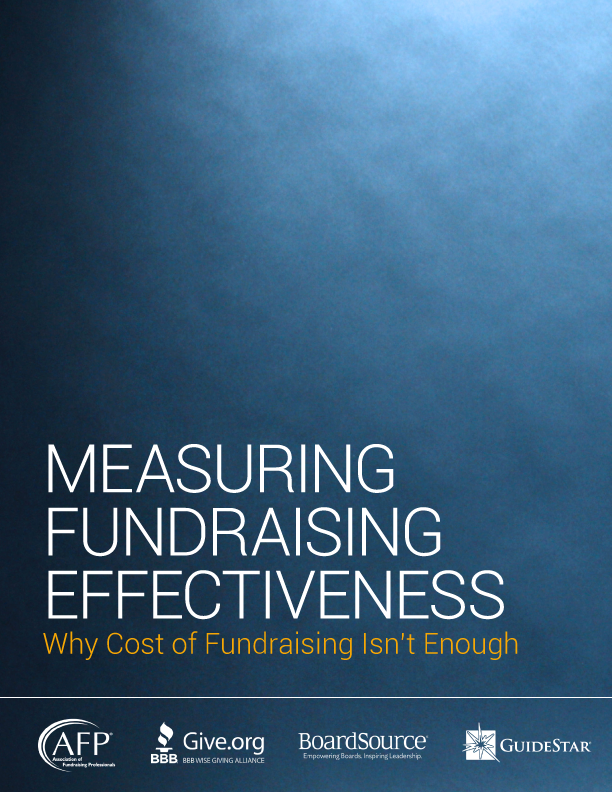 Build an understanding of the size and scope of the nonprofit sector and how it influences the work of the nonprofit board, as well as how it differs from the for-profit and government sectors. You must be an employee of a BoardSource corporate member to register for the Certificate of Nonprofit Board Education for Corporate Employees due to the amount of materials and resources provided to participants. Already a BoardSource corporate member? Register for the course today.